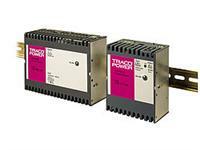 The popular TIS series is a range of DIN-rail power supplies in rugged metal case with a very low depth (57 mm for 50 to 150 W models resp. 83 mm for 300 to 600 W models). For system applications the basic models can be expanded with built-in function modules for true N+1 redundancy operation or to a battery controller to configurate a DC back-up system. Low Profile Metal Case, optional built-in Function Modules.